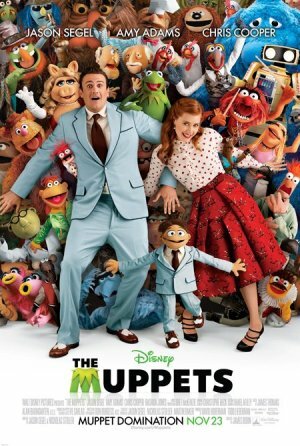 "The Muppets" is finally here in the Philippines and in short, the long wait does not disappoint at all. There are elaborate song-and-dance numbers, endless one-liners and even some modern takes on The Muppets formula and comedy. All mix for that perfect blend of nostalgia while bringing these old friends into the modern age. "The Muppets" will make you dance, sing, laugh and cry - it's that potent and it's that epic. Walter (Peter Linz) who is a muppet lives with his brother Gary (Jason Segel) in Smalltown, USA. Ever since they were young, Walter has always felt he was "different" not until he saw "The Muppets Show" on television. The show gave him solace as it portrays being a muppet a good thing. Now that they are adults, Gary plans to take his girlfriend Mary (Amy Adams) to Los Angeles for their 10th anniversary. As a suprise, Gary decides to also take Walter with them so Walter could see the Muppets Studio in person. Once they arrive in L.A., Walter discovers that the studio is in shambles and it is being sold to Tex Richman (Chris Cooper) who plans to demolish the whole thing as he believes there is oil reserves underneath. Walter and Gary decide to find all the muppets so they could raise $10 million dollars to buy back the studio lot before its too late. The secret formula for "The Muppets" is that they kept it really swift and simple. There's really no sense that they were trying to hard to make the film funny or even modern. Muppets fan would feel right in place while new fans will find the old humor, ironically, quite new. The soundtrack was a mix of new and hit songs (and even one iconic song from one of the old movies). The new songs were a deadly mix of short-sweet-funny while the hit songs never feel out of place. Both mostly feature elaborate and detailed dance numbers that only make them even better. As for the story, it was simply perfect - it's kiddie so that kids can fully understand what's happening but it's also takes a serious turn that adults will accept it without any hesitation. The best part for "The Muppets" are its final few minutes especially the final speech of Kermit the Frog. We won't spoil anything but it simply caps off an already too perfect movie. - this is simply one of the best movies this year. - no reason not to watch "The Muppets"